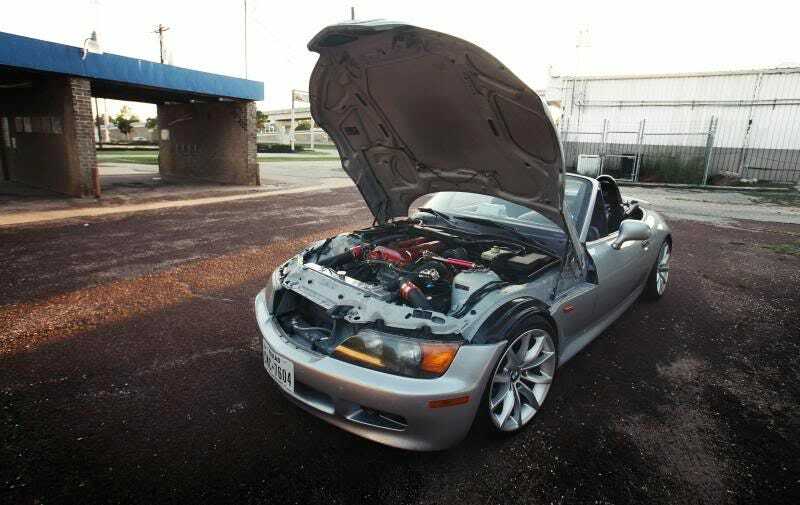 With its Nissan mill, today's Nice Price or Crack Pipe BMW Z3 is possibly the the most potent match up of Germany and Japan since… well, a very long time. Is this re-engined roadster however worth its asking? You know what really curdles my sustainably farmed organic soy milk? Cars that are claimed to have been restored, but that still have glaring and easy to fix problems. Worse that that are restored cars for which the restoration caused the problems. That brings us to yesterday's 1986 Grand Wagoneer. Yeah, it was a nice looking truck, and yes it did seem to be in good shape, but it also seemed… half assed. That, and not its meal-Instagramming sellers are what doomed that Jeep to a 73% Crack Pipe loss. For $10,999, It’s The InstaGrand Wagoneer! Look I know I said no more Germans this week - DON'T MENTION THE WAR! - but this 1998 BMW Z3 arrived in my inbox and, well, it's back to the 'Bahn, baby! You see, what makes this Bimmer fascinating is that it's not all Bavarian, it's got a little bushido tucked in too. That's because this one is powered by a Nissan sr20det, late of a Silvia or something. That isn't the Z3's only Eastern connection, oh no, not by a long shot. These were originally penned by BMW designer, Joji Nagashimi who was born and raised in Tokyo. Of course underpinning that body was a hot mess of multi-generational 3-series parts all of which came together in BMW's South Carolina manufacturing plant. The Z3 has never been known for being a paragon of structural integrity, instead typically twisting and shaking over imperfect surfaces like it was trying out for American Bandstand. This car however, is all about the engine. The sr20det mill was used by Nissan through all of the nineties, alternately offered in Redtop, Silvertop, and Blacktop forms. Unless I've gone colorblind, this one looks to be a Redtop. Dropping the Nissan mill in a Z3 is a surprisingly common conversion. It also should be one that gives this Z3 M-level power without many of the M-level headaches. The original engines in these cars were the M44B19 four and, after '97, the M52B28 six. The four was good for 138-bhp while the silky six offered up 189 ponies. Later cars said eff-you to the fours altogether with the M44 being replaced by a 170-bhp M53TUB25. None of those however could so much as tickle the balls of the sr20det, its turbocharged twin-cam two litres good for anywhere from 200 to upwards of 227 horsepower. The Garrett T25 common to these little rockers has a great rep and can push all kinds of boost without complaint. Keeping this one from turing the engine into a puffer fish is a Greddy BOV, north of the intercooler. A rebuilt head is claimed in the ad, as are new pistons and rings, the alternator, and water pump. As far as the rest of the car goes, it sports new coil overs, new tires on 245s, Sun pro gauges in the dash, and Sparco high-back buckets with 4-points. The bodywork looks clean, although - dude - that wing on the back is not doing you any favors. The title is clean and the car has 134,000 on the clock. Is everything however, cheeseburgers in paradise with this clean conversion? Well, in a word, no. The seller says that the car has a tendency to stall and attributes that to a failing idle control valve. The ad also notes that the interior has more rattles than an episode of Snake Salvation, and that - yes, here's the kicker - the diff has been welded. Have fun cornering with that. Okay, so some duct tape on the inside, a new pumpkin in back, and maybe get the idle control patched up and you've got yourself one hell of a summer ride. But is it worth $6,500? What's your take on this mashed up Bee - En (for Nissan) - Dubbayou? Is $6,500 a good price for so hopped up a car? Or, does that price make this a Z3 not to get mixed up with? H/T to Brodee for the hookup!